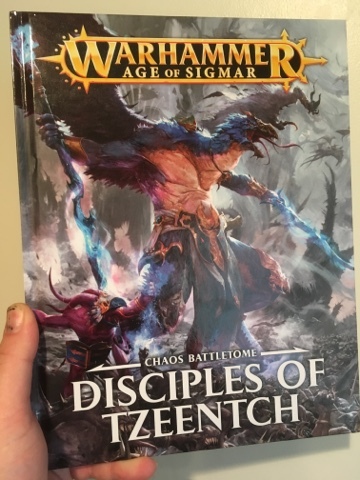 Today I'm lucky enough to be showing you a review of the new Battletome - Disciples of Tzeentch. 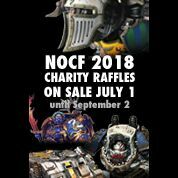 Games Workshop has supported the blog with a copy of the book and I would like to take this opportunity to thank them. This new book is an evolution from the old Battletome and it's very exciting to see the new direction. 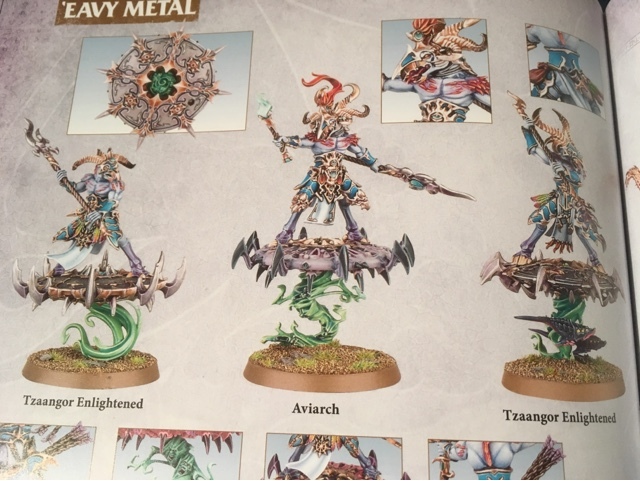 There are many options inside and plenty of new ways to play Tzeentch armies. I will be discussing a few of these new sections to give you an overview of the book. So let's jump straight in! The artwork in the book is really high quality with tons of new pieces that I have never seen before. 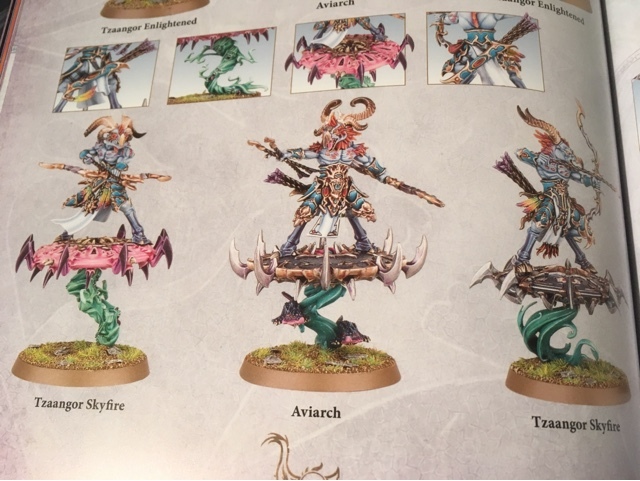 There are some great pictures of the Archanites and Tzaangors and a really cool, basic couple of pages that show off cult colour schemes and ideas for your own forces. To some these may be less than alluring but I find them functional and give enough examples and ideas to have helped me choose my own without having to bog down the 'eavy metal team for hours and hours. I am a big fan of the artwork in this book. You won't be surprised by any of the fluff around The Daemon side of the army, it mainly suggests that Demons are spawned through either warp rifts or are summoned by mortal Cults. 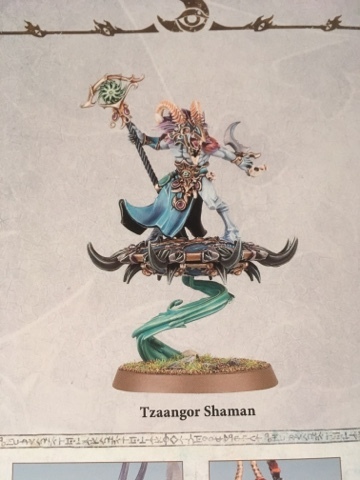 It does state that Tzeentch is partly responsible for Slaanesh's disappearance but doesn't explain any further than that. There is no real revolution to Daemon fluff here, but there are different ways to field your Daemons if you look through the Battalions. There are so many Battalions in the book that I am not going to delve too deeply into them in this review. Just know that there are some really huge Battalion options in here and some of the rewards are super cool. 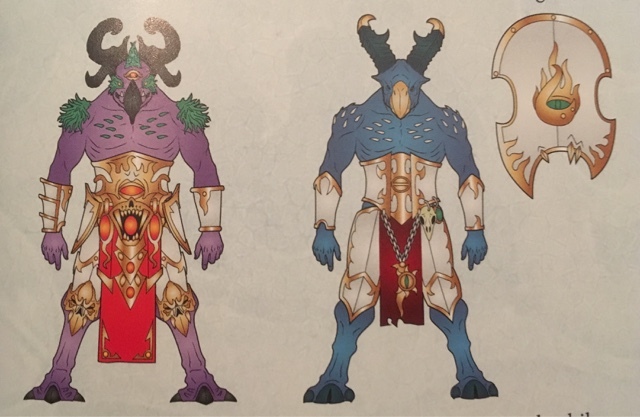 The Archanite Cult fluff in the Battletome is the more interesting part and appears to take place after the Realm Gate Wars, discussing how the Disciples of Tzeentch either strike from the wilderness or from inside the rising civilisations of the free people's. For me, it is by far the best part of the book and there is a real wealth of detail to inspire would-be collectors. There is even variations in the structure of each Cult allowing for even more customisation and uniqueness. 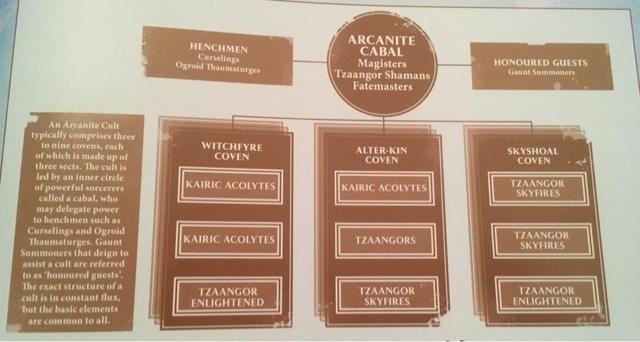 Each Cult is lead by a Cabal which controlled by a Magister, Tzaangor Shaman or a Fatemaster. 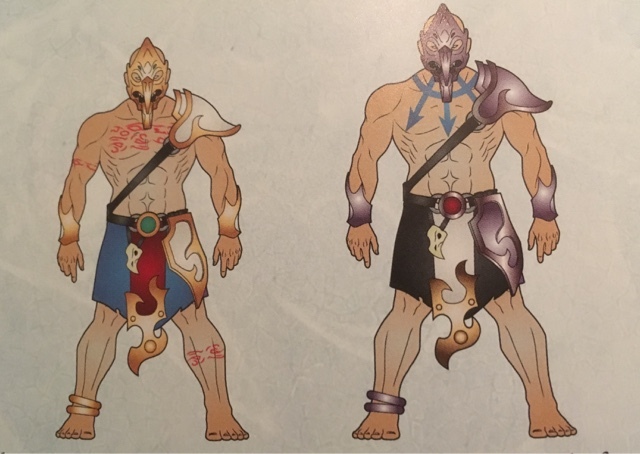 It can be lead by one, two or even all three and makes up the beating heart of the Cult as each hero buffs units or hinders enemies in a different way. The Cabal can be joined by an honoured guest in the form of a Gaunt Summoner or with henchmen, which is Changelings or Ogroids. Under the Cabal is different sects which are made up for different variations of units, each of which get a Battalion which further rewards fluffy and thought-out play. I really like that the fluff in the book is more around the actual faction than how they fit in to the overall storyline. It allows for people to create their own stories with a huge degree of freedom, something that the Old World seemed to lack. There are 6 command traits for each of the Tzeentch factions, Daemon, Archanite and Mortals. 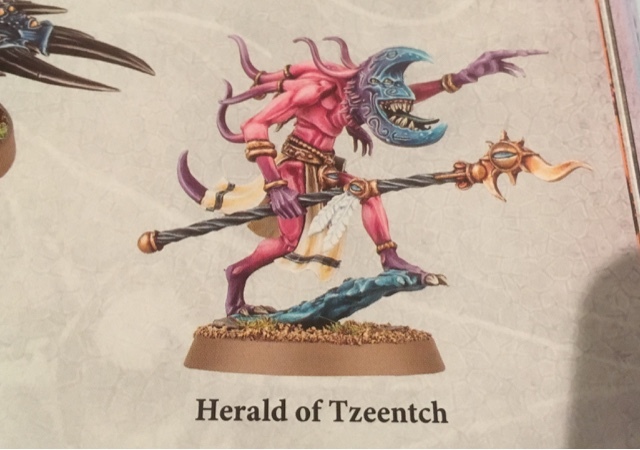 The mortal Tzeentch army isn't really fleshed out at all in the book but there are enough bits from the command traits and access to their own artefacts to create a unique feeling army. The Archanites also have access to an artefact table whereas the Daemons have 2 tables of gifts - one for weapons and one for Daemonic powers. Under all of these sections it suggests suitably modelling and creating fluff for any boons you take. Awesome. There are 2 psychic power charts that you can generate from with your various heroes - The Lore of Fate (Mortals and Archanites) and The Lore of Change (Daemons). There are the usual buff/debuff and missile (mortal wound) attacks here which is really cool. 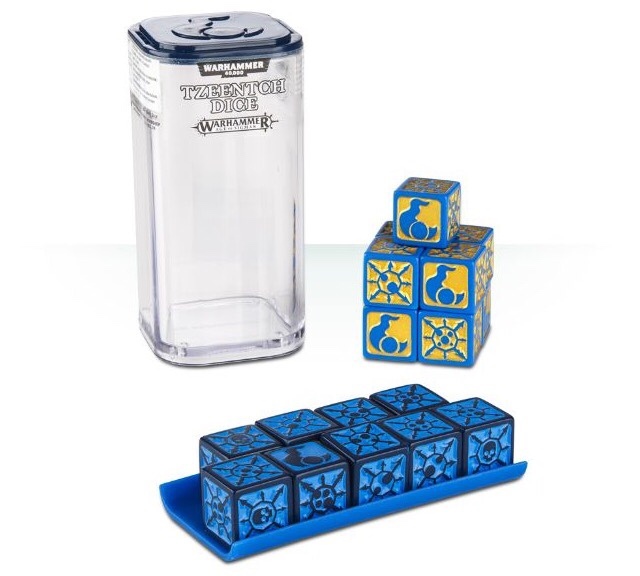 Tzeentch armies can also take a pool of Destiny dice to show the fickle nature of Tzeentch. Some of the artefacts and traits/powers above can help to replenish these throughout the game but here is an overview of how they work - At the start of the game you roll a pool of 9 dice and keep them to one side (great if you use the new Tzeentch dice that GW released today), then at any point in the game you can choose to use one of the destiny dice to replace the result of a dice you would roll. You have to do this before you roll any further associated dice but then it uses that destiny dice and you can't use it again later on. This is a really useful mechanic for Tzeentch players and I can imagine it being a lot of fun! There is a full Path to Glory section in the book allowing you to expand on the one in the Generals Handbook! For me, this is a really nice touch as I am a massive fan of escalation style campaigns to build my force and motivate me to paint. It also helps create a sense of an evolving story and keeps the player engrossed, rewarding their hero with skills for playing well, with Champion and Follower rewards tables as well as 3 Patronage of Tzeentch tables. Super cool. In the back of the book is all you need to field the Disciples of Tzeentch in Pitched Battle play with full points listings and Battleline unit guidance. I am glad it has been included and I am even more glad that it only takes up one page. As a massive fan of the no points system, I feel that dedicating a single page means that Games Workshop still stand by the way they wanted the game to be played. The Battleline units for Archanites are the Acolytes or the Tzaangors, for Daemons it is Pink Horrors as standard but you can take Burning Chariots if you take Daemons of Tzeentch Allegiance and a Herald. Overall I have to say I am tremendously impressed with the book and it excites me for the future of the game. We could see a Free People's book with each of the different factions inside expanded or maybe it will be less than that. Maybe we will see a Duardin Battletome with each of their factions (maybe throw the Fyreslayers back in too with Warlord Traits and Artefacts. Who knows! It really could go anywhere! I will be doing an Archanite Cult as my next AoS project and will be creating some fluff for them inside our evolving campaign we hope to start later in the year. I hope that you have enjoyed my review. Please feel free to comment below or ask questions. I will endeavour to answer them all. If there is anything you would like me to do differently next time (if GW want us to lol) then please say below. It will really help us. I have a question actually. Are there pictures of new Blue/Brimstone Horrors? 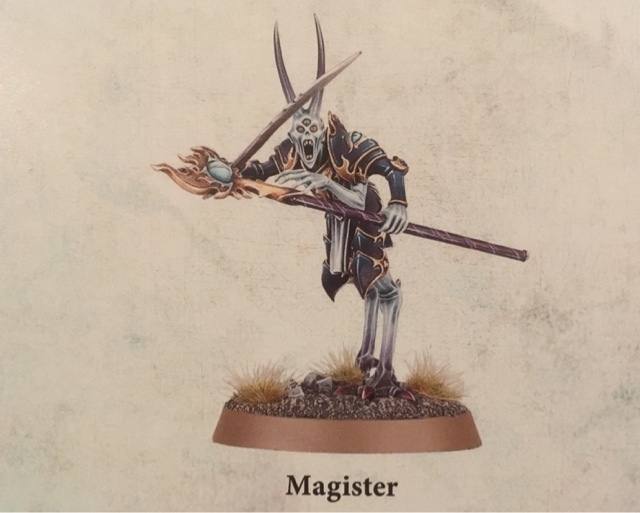 And what model is actually this fabled Magister? 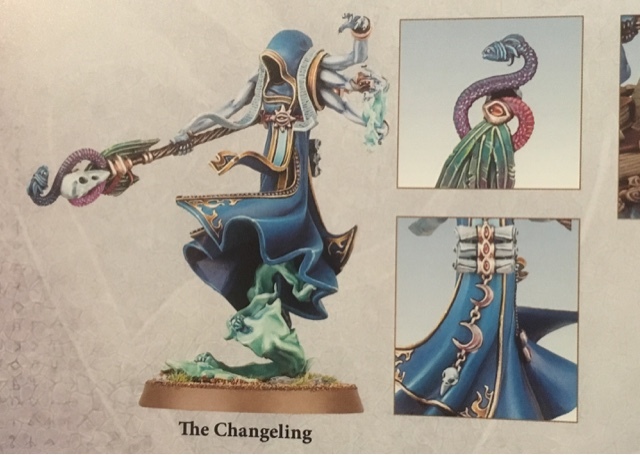 Is it old Tzeentch Sorcerer Lord or something new? I believe his sprue was re-cut for that set (on account how the old miniature the scenic rubble and square base were all in one); there's a good chance he will be released as a single miniature for this most magical of releases. Wow this book looks amazing, I can't wait until my pre-order arrives.... I agree with you, this is definitely propelling the game and giving a lot of old hobbyists the material they want and need to come back! I am a Khorne player for AOS but I am jumping on the band wagon and going to give some magic a go! I hope that it brings back more players. The most compelling part of the setting is that it can literally be whatever you want! It will be interesting to see other factions and the way that they integrate in the mortal cities. Looking good! I agree I'm a fluff lover and the realms are so fascinating....... create from the ground up. Any hints on the battalions to help curve our purchases? I really cannot wait to make a story for my future army! Geez the LOC and Kairos are just gorgeous! Id be interested in the cult battalions before I order more Tzaangors. Allows the Acolytes to cast there missile attack in your Hero phases. So grab some more Acolytes too lol!! This gives the units extra movement and some mortal wounds output. Makes the units able to do more attacks and better to wound rolls. This is essentially a mixture of the Heros and effects both psychic powers and the destiny dice pool in positive ways. 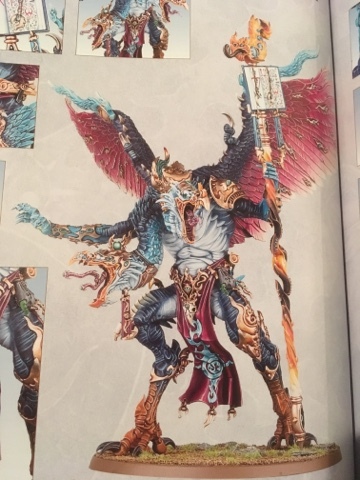 They are a wayward cult of Kairic but they don't have any real leadership or the extent of their powers until one day a Curseling Eye of Tzeentch comes along and opens there eye.. There ultimate goal is to bring a Lord of change into the realm but the kicker.... they aren't too happy with daemons since they lost a lot of onfustruxtire while playing around with Brimstone horrors. Thank you for the cult battalion overview. :) Any chance you could do the same for the other ones? Thanks for sharing this Kaelo. Really insightful review! Can you give us any information on some of the traits/artifacts? Any of the formations contain the skyfires that look viable? As they will be popular! I require the disk Tzaangors on my desk. By reckoning, it means the Lord of Change may mean going into town to collect it to pick it up on weekend release. Is it possible for you to go through the book in an extended review? Hi buddy. Is there anything in particular you want to know? I am very keen to not provide spoilers or infringe on GWs hospitality so I didnt want to go too deep. Happy to answer questions though. For one more question, is a LOC able to accompany one of the alter-kin or wychfyre covens. He isn't in the Battalions if that is what you are asking? Awesome review! I really like the sound of the destiny dice mechanic! Very fluffy! Book looks great, it's great to see them evolving and getting better. 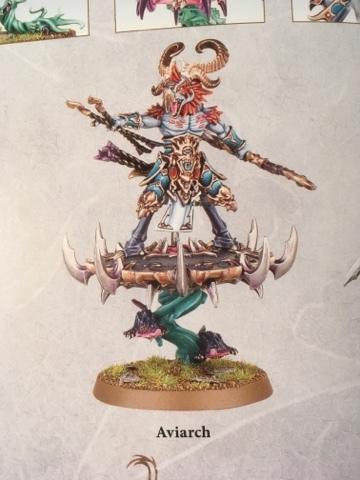 Shame the Sylvaneth got there book so early! Lol!